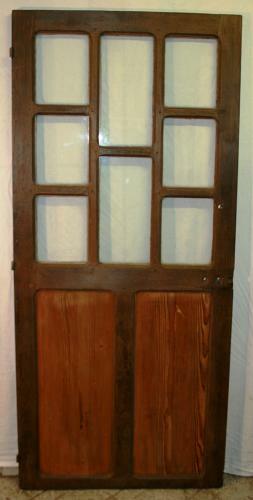 An interesting and unusual reclaimed oak door with pine panels. The door is believed to be French and dating to approximately 1960-70. The top of the door has 8 panels glazed with perspex, not glass, which means the door does not have the safety issues concerned with glass. The oak around the perspex has an attractive edge to the front face of the door, which gives the door a retro look. The door has two further panels under the perspex, made of pine, with a nice grain and finish. The door is waxed and is of a rich colour. The door has a slip type hinge and therefore has the door half only. Purchaser will need to replace hinges or purchase the second part of the hinges needed to attach to a door frame. The door is reclaimed and therefore has some signs of use and wear. There are some slight splits and cracks to the oak and pine. There are some knocks to the panelling, erosion and staining. The perspex glazing has been simply puttied in, and this can be seen on the back face of the door. There is some damage to the oak, near one perspex panel. Some tarnish and slight surface rust to the key plates. The lock has been removed and therefore left a mark and cut out, please see pictures for details. A door with unusual and attractive styling that would make a great interior door for a retro or vintage property.